This year, the Buddhist holy days of Asalaha Bucha and Khao Pansaa fall on July 22 & 23. Both are recognized public holidays, and therefore banks and most businesses will be closed. The Buddhist Holy Day of Asalaha Bucha falls on the 15th night (15 kham) of the full moon during the eighth month of the Buddhist Lunar calendar, this year equating to Monday, July 22. “Asalaha Bucha” means paying homage and worshiping on the day identified according to the lunar calendar during the eighth month, Asalaha being the name of the eighth month in the Pali language. This year, the Buddhist holy days of Asalaha Bucha and Khao Pansaa fall on July 22 & 23. Many activities are planned throughout the city, especially at our temples, and everyone is invited to take part. Asalaha Bucha Day is worshipped because of three important events occurring on the day. Called the “Triple Gem” (the Buddha, Dharma and Sangha), these commemorate the first sermon given by the Buddha, called the “Dharmachakapavattama Sutta” concerning the “Four Noble Truths” presented to the Buddha’s first five disciples. The sermon set in motion the “Wheel of Dharma”, which is the meaning of “Dharmachaka”. The sermon concluded that: 1. All things are a source of suffering from the constant cycle of birth, disease, old age and death. 2. Desire or the inability to obtain what one desires is the cause of suffering resulting from cause and effect. 3. Freedom from suffering can be obtained after the complete cessation of desire. 4. The last of the Four Noble Truths is the “Middle Way”, or the path between extremes of asceticism and indulgence leading to the eliminating of desire. The Eight-Fold Path consists of possessing the correct: Views, Resolve, Speech, Conduct, Livelihood, Effort, Mindfulness, and Meditation (or Concentration). The third of the Triple Gems is the Sangha. On this same day, the first person listened to the Buddha’s sermon, realising the truths contained therein and becoming the first Buddhist monk. This created the Buddhist order “Sangha” and the day is known as “Sangha Day” as well as Asalaha Bucha Day. 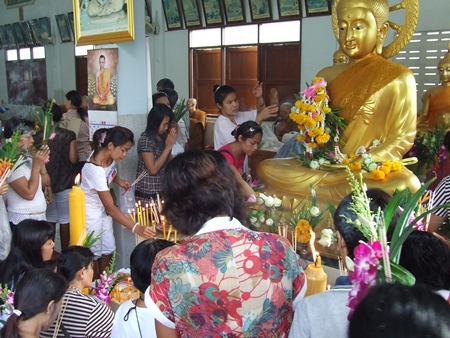 The Thai government established the observance of Asalaha Bucha Day in 1958. Buddhist temples throughout the Kingdom arrange ceremonies venerating these important historic events. Devout Buddhists participate in the ceremonies by presenting offerings to monks, listening to sermons and performing ritual prayers. The entire day is revered and certain precepts are adhered to by the more devout Buddhist, and by those who have the inclination and opportunity to do so. The Wien Thien ritual ceremony is performed in the evening as many go to nearby temples bringing candles, flowers and joss sticks, completing three trips walking around the temple area sacred grounds. The day after Asalaha Bucha Day, another important Buddhist holy day begins in Thailand with the custom called Khao Pansaa, the start of Buddhist Lent. This day falls on the first full moon (1 kham) of the Buddhist lunar calendar during the eighth month of every year, which this year equates to Tuesday, July 23, and ends on the 15th full moon (15 kham) of the 11th month of the Buddhist calendar, usually in mid-October. During a leap ear it is identified during the second eighth month. The term “Khao Pansaa” can also translate to entering the months of the rainy season when monks return to the temple for the duration of the rains, usually to the temple where they were ordained. They stay there for approximately three months. The monks are not supposed to depart the temple, or stay overnight at any other location during the months of rain. Although the rainy season is considered to be longer than three months, lasting up to four or even more, monks are only required to remain at the temples for three months. During the last period of the rainy season they can then go elsewhere when the Katin ceremony is performed, whereby new robes are presented to the monks at the temples. Initially, monks were discouraged from travelling during the rainy season because of the idea that it was inappropriate to walk about during the rainy season when many small living creatures were about, which could be accidentally stepped on. This included the rice crops. Inclement weather also made it difficult to get out and about. Therefore, it was established long ago that the monks would remain in temples during the rains for three months, discussing and studying Buddhist scriptures, following Buddhist disciplines, meditating and performing ritual ceremonies. The custom of Khao Pansaa has continued to this day with three classes of ceremonies, a Royal ceremony conducted by the King of Thailand, ritual ceremonies for devout followers of Buddhism throughout the Kingdom and ceremonies performed by monks in the temples. The Royal ceremony is similar to the ceremony performed by the general public, but more elaborate. HM the King and members of the Royal Family perform ritual ceremonies to pay homage to Buddhism, and present Khao Pansaa candles and traditional garments to Buddhist monks. The Royal Family also donates many other items used in these ceremonies. Other followers of Buddhism all over Thailand will attend temples in the morning, bringing food, necessity items, money, the traditional candles, garments and ceremonial items for the monks, with flowers and candles in hand. The ceremonies performed by monks in temples revolve around rituals accepting new monks, who take vows for periods up to the three months, with some staying even longer. Senior monks at each monastery perform other ceremonies leading followers in worship and prayer. The two main items presented to monks during Khao Pansaa are the candles and garments worn by monks, specifically the bathing robe. The candles were essential in former times and needed for ceremonies, studying scriptures and performing various other functions. The candle offering has developed into a custom still followed. The presentation of garments worn by monks is said to have originated from methods of bathing in former times, commonly done in community areas using streams, rivers, ponds and other sources of water, with monks requiring a bathing robe. The garments worn by monks continued to develop until the custom included presenting the entire arrangement worn by monks.